Do you have a formal art education or are you a self taught artist: I will receive my BA from Bethany College in 1 year and a half. 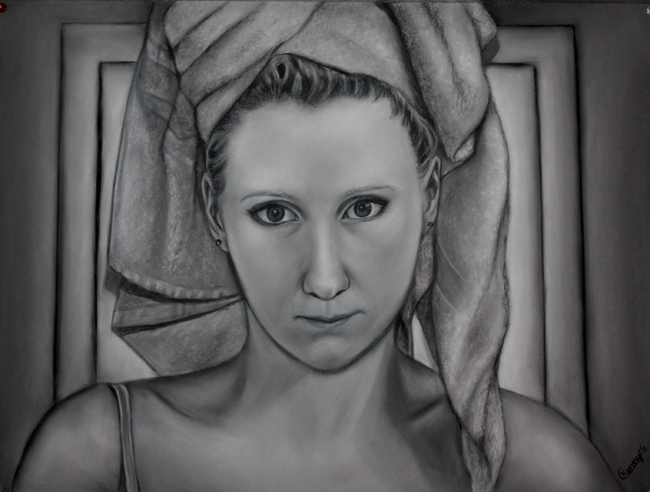 What is the style of your pieces: My pieces mostly consist of realism or figurative works. What is the medium in which you work: I primarily work in charcoal. However, I also enjoy using graphite, oil paint, and acrylic paint. What started you on your path as an artist: I have always loved to draw. I can’t remember a time in my life in which I was not fascinated with art. What is one of the most important things that art has brought to your life: I think one of the most important things art can do is to help one see the beauty in everyday life. It helps us to stop and take a closer look at things, which we otherwise might not notice, as well as see the world in a different way. For me personally, art is also a great stress reliever. What is your favorite genre of art besides the one you work in: I am for the most part, a realist. However, I love abstract paintings, particularly those with bright colors. Do you have art showings, and if so what are they typically like: I have been in several juried group shows as well as a couple of solo shows. They are typically laid back. I love interacting with people and speaking about my work, so my solo exhibitions have been geared in a way in which I can speak with people and answer questions about my work. I am always looking for new venues to exhibit my work. Do you have a certain set of clothes you make art in: I work in anything that is comfortable, jeans, sweats, shorts, whatever I can find that I don’t have to worry about getting ruined if paint or charcoal gets on it. What has been the most frustrating part of being an artist? The most frustrating part of being an artist is the lack of confidence society has that one can make a living as an artist. I get frustrated with the negative attitudes that many have about earning a living off of selling artwork. What is your favorite sandwich of all time: I am a fairly picky eater. My brother says that I don’t like anything that’s not bland. Thus, my favorite sandwich is plain turkey and cheese with no condiments. Has this year brought about any changes in your work, and if so what are they: My artwork is always changing as I acquire new life experiences. However, most of these changes are very gradual and cannot be pinpointed to a single element or year. Who is your favorite artist alive or dead: My favorite artist is Andrew Wyeth. I love his ability to capture humans and animals looking natural and un-posed. What is the most moving piece of artwork that you have seen in person: Off the top of my head, the most moving piece of artwork I have seen in person was a painting by Kent Bellows. I don’t remember the name of it but it was a self-portrait in front of an old wall that had bullet holes in it. It was a piece about being cut down by art critics for being a realist painter. The strength and defiance shown on his face was captivating and I could identity with the message. Do you have any animals, and what do they think of your work: I have two dogs, a Labrador and a Beagle. They could care less about my work since it is not edible. Do you have any upcoming exhibitions you would like to share with us: My work is currently on exhibit at RBC Wealth Management in One Pacific Place.